This meal is like having your own little Octoberfest on a plate! Fresh, local cabbage, apples and smoked sausage braised together until you have fall deliciousness that is tart, sweet and a little floral. No more of that stinky cabbage of years past–this is fresh and flavorful. I made extra just so I could take some for lunch! You can use any kind of smoked, link sausage in this dish. We actually used a combination of smoked jalapeño sausage and smoked Polish sausage from Mae Farm. Their sausage is so good I could just inhale it. We used three kinds of apples as well–one tart, one more floral and one sweet. Our favorite is the crisp and tart Dixie Red, a sassy heirloom variety apple found here in North Carolina. Mr. Godwin of Godwin Farms helped me pick out a blend of apples that would go well with both the cabbage and the sausage, howgreatisthat? In a large skillet or Dutch oven, brown the sausage over medium heat, rendering some of the fat. This will take about 10 minutes. Remove the sausage and set aside. Leave about 2 tablespoons of drippings in the pan. Return the skillet to medium heat and add the onions. Sauté the onions for about 5 minutes or until soft and translucent. Add the apple slices to the onions and stir well. Cook about 2 minutes. Add the cabbage, sausage, cider, salt, pepper and coriander to the pan or pot. Reduce heat to low, cover and allow everything to cook down, about 45 minutes. Stir often. If pan juices begin to dry, add some water to the pan. Delicious fall dinner I’ll have to pick up some great rye bread to go with it. Rye would be perfect! Enjoy! When do you return the sausage to the pan? Or did you cook the sausage completely and serve it on top. Good question! I’ll update the posting! I put the sausage into the cabbage once the cabbage is softened and simmer it all together for about 45 min! Made this yesterday for dinner with homemade rye bread. 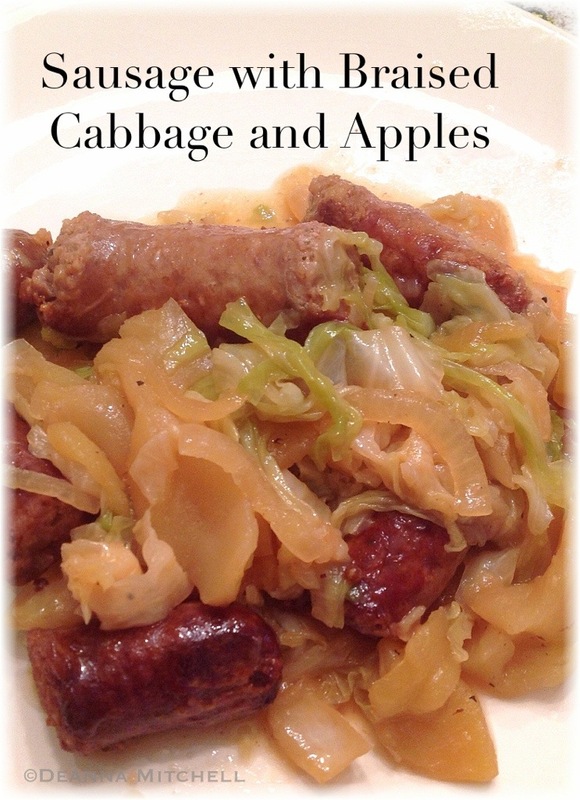 I did substitute organic Italian chicken sausage for the pork and used savoy cabbage. I am not sure if that matters and it was delicious. Would definitely make again. So glad you liked it! I think any sausage would be delicious! I may try chicken sausage next time!